Just like the United States Constitution, a burger means different things to different people depending on which state you’re in. To wit, since the invention of the “hamburger sandwich” in Connecticut in the late 1800s, folks all over this great nation have tested new ways to grill some meat and stick it on a bun, and today there are as many regional burger styles as there are things to put on a burger (read: infinite). 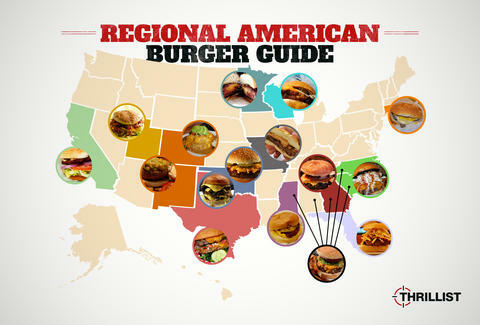 These are the 16 essential regional American burger varietals. If there’s one we missed, don’t hesitate to tell us about it in the comments section. For liberty! The origin story: Invented by John Weeks back in 1917 in Corinth, MS, they used to be called “Weeksburgers” because dude was totally into himself. But as the style gained popularity in the small NE Mississippi town, the moniker “slugburger" was adopted, a nod to the old slang word for “nickel”, which was the cheap price of the burgers during their wartime birth and, later, Depression-era growth. The recipe was specifically designed to stretch ingredients further for those lean-times, and the soy meal extender gives the burgers a tender interior and crunchy exterior. The origin story: Not just a term used to describe a girl who’s smokin’ hot everywhere except for her burger (hey-o! ), “butter burger” is probably the most Wisconsin combination of words ever, and this Wisconsin-area specialty style (most likely invented at Solly’s Grille, which opened in 1936) utilizes butter in pretty much every iteration you could imagine -- people soak the buns in it before grilling them, drop a pat on the patty while it’s cooking, or actually make the patty WITH BUTTER IN IT. The origin story: Utah might not be as famous for its pastrami as, say, New York City, but they’ve made some serious strides with it in terms of burger innovation. Salt Lake City in particular has been serving up burgers topped with pastrami, cheese, and Thousand Island dressing out of its many Greek diners and restaurants. The trend was started by Crown Burgers (which was founded in 1978), and spread out like oil in a salty lake from there. The origin story: This burger style is shrouded in mystery, but was most likely a symptom of California exporting its culture all over the country ever since the 1970s and 1980s. In most places East of the Mississippi, a “California burger” is a burger with lettuce, tomato, and onion (which have come to be the standard burger veggie toppings). However, closer to the source, a California burger is considered any burger with guacamole/avocado and bacon and is eaten regularly by Arnold Schwarzenegger. Probably on a tank. The origin story: While some of the best (and most well-known) onion burgers are comin’ out of El Reno, the origin of this widely adopted burger style is actually in Ardmore from the 1930s, where the head cook at the Hamburger Inn smashed onions on top of the burger patties he was griddling in order to stretch the meat supply a bit more for his customers. 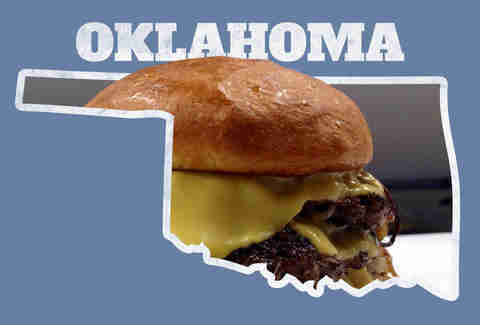 The origin story: A relic of long, complicated delivery orders placed by members of the Kappa Alpha Theta sorority at the University of Oklahoma turned into a popular Norman/Oklahoma City burger style after Town Tavern, the restaurant taking the sorority’s huge requests, decided to honor them with their own signature burger (and probably make their orders a lot easier to communicate) sometime in the 1930s or 1940s. The origin story: Not to be confused with something that your vegetarian college roommate kept in your shared freezer, a San Antonio bean burger exists almost exclusively in the greater San Antonio area (elsewhere, it’s called a tostada burger and is made ever-so-slightly different with the inclusion of cheddar cheese). It was most likely invented at Sills Snack Shack in the 1950s, though by whom remains a subject of debate. Whoever it was, though, was probably unpleasant to sit next to on a bus afterward. The origin story: The actual story of the original Carolina-style burger remains hidden in the murky depths of chili history, but we do know that the first standard chili burger was served in California in the 1920s by the awesomely named Thomas “Ptomaine Tommy" DeForest. 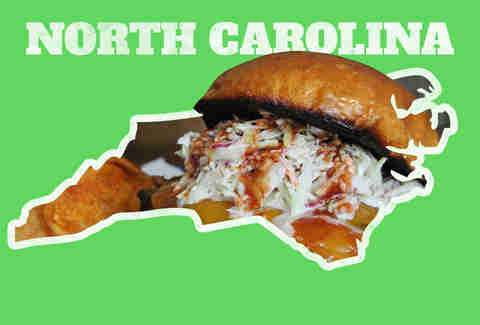 And, well, since Carolinians tend to eat a lot of chili, coleslaw, and mustard already, the next logical step was to place them all on a burger. Make sure you’re getting Duke’s mayo in the slaw. The origin story: Nobody knows exactly where and when these two comfort food heavy-hitters came together, but we do know their union is a harmonious and beautiful one, and we wish them all the best. Dammit, we said we weren’t gonna cry! The origin story: Whether it was a favorite of the famous singer Luther Vandross or was actually invented by him in a moment of bunless desperation, now-shuttered Decatur, GA restaurant Mulligan’s used the burger’s rumored beginnings as the inspiration for its donut-sandwiched bacon burger, which its owner brought to the national scale in 2005 on The Tonight Show. 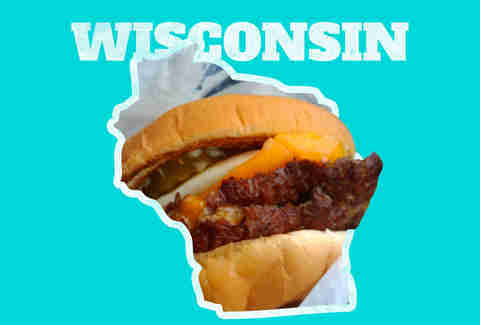 The origin story: Surprisingly NOT from Wisconsin, this cheese-lover’s dream burger has an oft-debated origin, but it was most likely first served at a place called Matt’s Bar sometime in the late 1950s, when a customer requested a burger with cheese in the center, and Matt lovingly obliged. When he bit into it, the customer apparently exclaimed, “What’s a juicy lucy!” presumably because vulgarity hadn’t yet been invented. 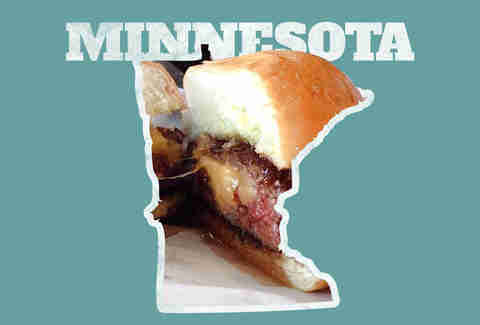 Soon after, places like 5-8 Club began laying claim to the burger too, and Minneapolis folks knew they were onto something big. The origin story: Green chile is a staple of both New Mexican and Coloradoan cuisine (although NM claims this particular chile-coated invention), whether in sauce form or chopped up and put on top of, well, just about anything they can get their hands on. So it should come as no surprise that one of the favorite condiments of people in this region when they’re eating a burger is green chile, and has been since around the 1950s. The origin story: This variant of the green chile cheeseburger takes itself a bit less seriously and is usually comprised of an open-faced cheeseburger served in a bowl and topped with hot pork-based chili stew in a manner that has been affectionately dubbed “slop-like”. It was most likely first made at Pueblo bar Gray’s Coors Tavern in the 1950s. The origin story: The hamburger was most likely invented in the state of Connecticut, but it was Jack’s Lunch in Middletown (most likely in the 1920s) -- and subsequently the entire town of Meriden -- that took the idea and did something kinda weird with it. Generally cooked in a specialized cabinet, steamed cheeseburgers are exactly what they sound like: the burger patties are buffeted with piping-hot water vapor, while the rolls they’re served on are room temperature. Kind of a weird thing to do with the legacy of Louis’ Lunch, but hey, it’s a free country. The origin story: In what is almost assuredly exactly what George Washington Carver had in mind when he invented peanut butter, Central Missouri tavern The Wheel Inn Drive-In started hawking peanut butter-topped burgers (dubbed “guber” or “goober” burgers) in the mid-20th century. Since then, the restaurant has closed, changed owners, and closed yet again, leaving the forecast uncertain for this once-lauded burger. The origin story: OK, so they aren’t exactly FROM South Florida, but fritas Cubanas (or just “fritas”, which are not just more feminine versions of Fritos) are quite popular there, and are sometimes referred to as “Cuban hamburgers”. They first appeared in Miami in 1962 at Fritas Domino, which is still serving the burgers today. They’re also Obama-approved, as he stopped by Coral Gables’ own El Mago de las Fritas when he was in town. Adam Lapetina is a food/drink staff writer at Thrillist, and wishes his state had a specialty burger. C'MON MASSACHUSETTS. Read his musings on Twitter at @adamlapetina.